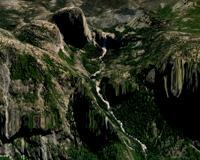 Below you will find information and tips for hiking to the top of Half Dome in Yosemite National Park. The Half Dome hike is an amazing hike that culminates to a very steep climb up secured cables to amazing summit views. It is an exhilarating experience you will not forget. 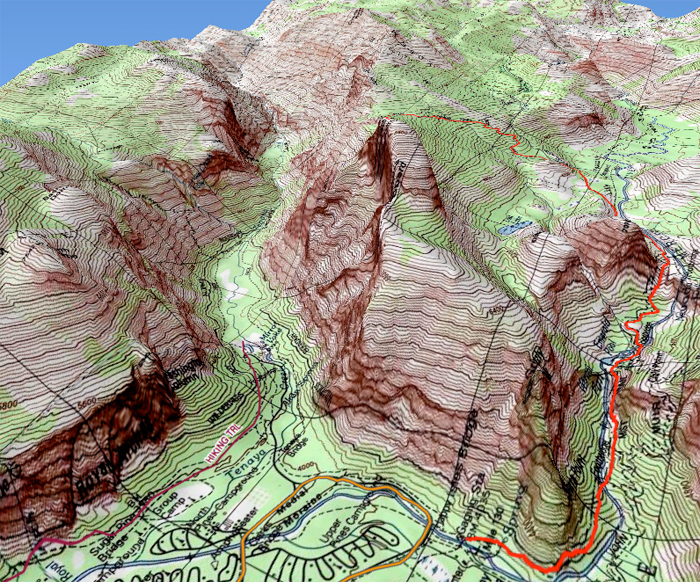 Click on the images below to see 3D Topo maps of the hike! 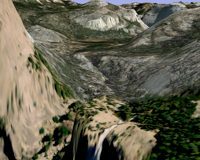 Virtual Half Dome hike video: This video will give you a pretty good idea of where the elevation gain is during the hike. The toughest part is getting to the top of the Mist Trail. Make sure to do the Mist Trail in the early morning before the sun is on it! 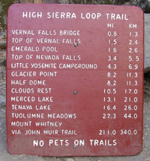 Once you are at the top of Mist Trail you get to enjoy some flatter terrain for awhile before things get steep again. The cables are expected to normally be up between May and October. Before and after these dates the cables will still be attached to the face, but the wooden steps and metal supports are gone. It is still climbable without the wooden slats, but very dangerous and not worth risking your life for. 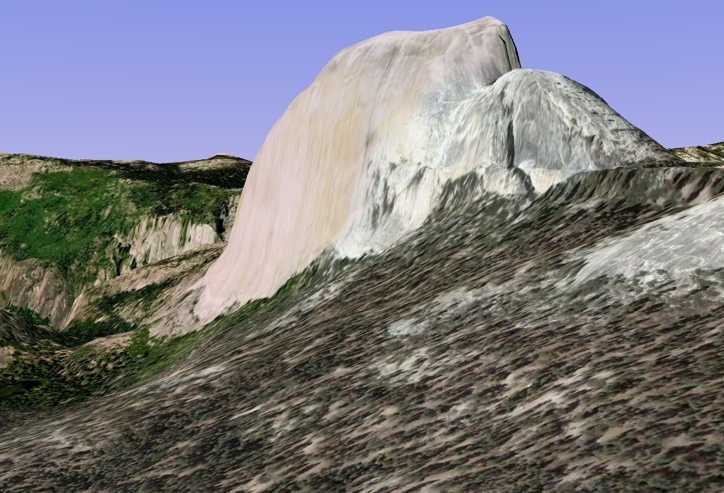 A permit is now required to climb Half Dome. This is essential. If you plan to hike up Half Dome, don't head off without a permit and hike up all that way only to find that you can't hike the last (best) part. NPS rangers do station themselves at the base of the cables and require you to show your permit to climb to the top. There are Preseason permits that you can apply for using the NPS lottery, but there is a also a daily lottery you can do to get your permit. From the NPS Website: Approximately 50 permits will be available each day by lottery during the hiking season. These permits will be available based on the estimated rate of under-use and cancellation of permits (the exact number may change through the summer). The daily lotteries will have an application period two days prior to the hiking date with a notification late that night. (So, to hike on Saturday, you would apply on Thursday and receive an email notification of results late on Thursday night. Results will also be available online, or by phone the next morning.) The application period will be from midnight to 1 pm Pacific time. If you want to climb Half Dome and don't already have a permit, don't let the permit requirement slow you down. If you are able to have a few days in the Valley you should be able to acquire one. I have always found the NPS folks to be very friendly and want to help you do your trip. It may take some persistence and even an extra day or two sometimes, but you will be able to get your permit if you want one. I recommend early August through late September as the nicest time to be in Yosemite. Specifically because the bugs (mosquitoes and flys) are usually all gone by this time, and the weather is still really nice. 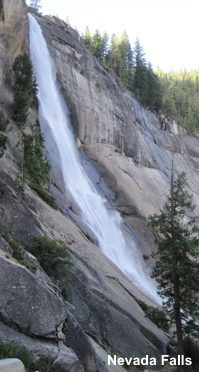 Some of the other Yosemite waterfalls (including Yosemite Falls) won't be running during these latter months, but Vernal and Nevada Falls will still be flowing. 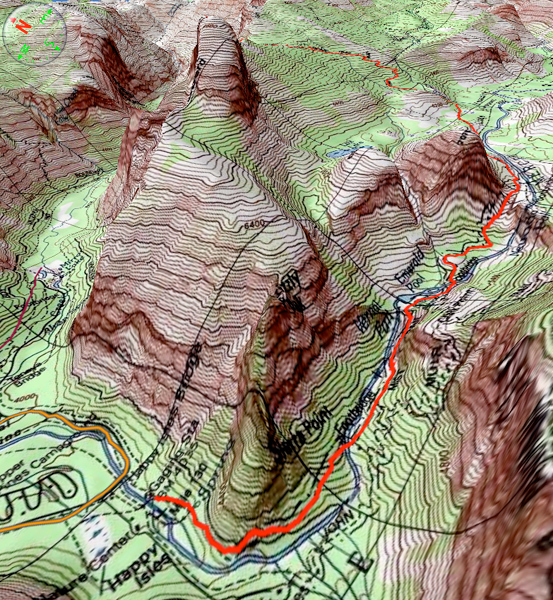 Not as dramatic and raging as the early season, but hiking when it is really buggy out can ruin a trip. Curious as to what the weather was doing on a certain date last year or the year before? 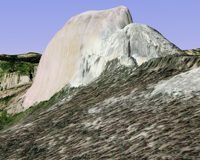 Take a look at my other site - HalfDome.net to see time-lapse movies of Half Dome from any day you choose. 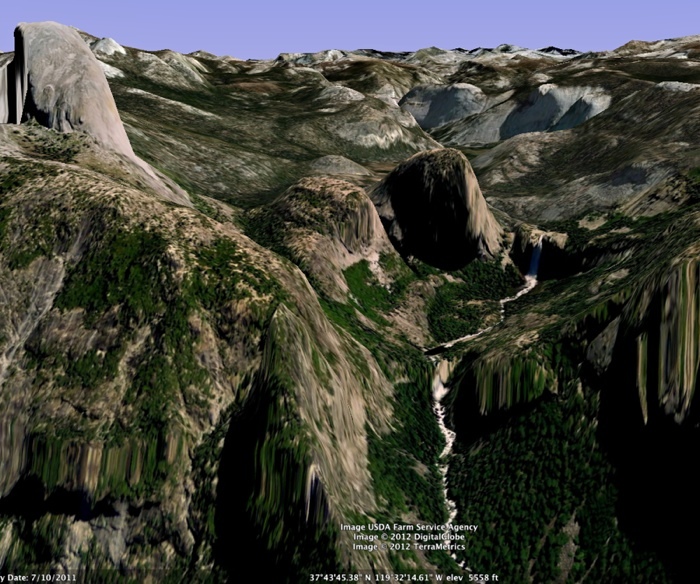 Day Hike or camp overnight at Little Yosemite Valley? If your goal is to climb Half Dome, I recommend climbing it in one day and not camping at the Little Yosemite Valley camp site. This is for two reason, 1) hiking with a day pack is much more enjoyable than hiking with a gear filled overnight pack, and 2) camping in Little Yosemite Valley isn't really that nice of a camp spot. That's just my personal opinion. Whenever I hike by that campground I always laugh at how it is packed with people who hiked a great distance to camp within 30ft of their neighbor. If you want to go camping in Yosemite, I recommend skipping the Valley and driving up to Tuolumne Meadows. Yosemite's Tuolumne Meadows has less crowds, lots of easy backcountry camping options and as amazing scenery as Yosemite Valley. 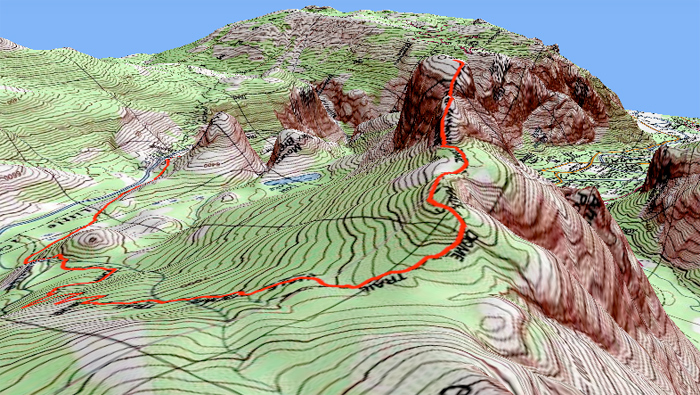 Click on the images below to see full sized Google Earth images of the hike. Where to stay in the Valley? Curry Village Tent Cabins: For the budget traveler that doesn't want to camp, this is the way to go. Nothing glamorous, but the cheapest accommodation you will find in the Valley. Bring some ear plugs, it can be loud at night if your neighbor snores. 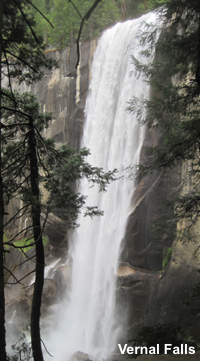 Camping with a reservation - Upper Pines Campground: There are other campgrounds in Yosemite Valley, but the Upper Pines is the most convenient for access to the Half Dome trailhead for your early morning hike. Day Pack: The lighter the better, just big enough for your day gear. Shorts / light hiking pants / warm layered top: Go light and comfortable, but be prepared. Water bottle (x2): Nalgene, camelback... whatever your favorite. Boots: Whatever is comfortable, I recommend lighter boots instead of big heavy leathers, but everyone has their preference. Some folks hike in tennis shoes if conditions are nice. Vibram soles are the best for grip when climbing the granite. Sun hat & warm hat: Both are essential. Extra socks: I change my socks every few hours when hiking. Keeping your feet dry lessens the chance of getting blisters. Waterproof shell: the lighter the better, you probably won't use it... but you'll be glad to have it if conditions get bad. If you find yourself about to start on the trail without one, grab a plastic garbage bag. If it does rain you can fashion a poncho out of it. Camera: Don't forget to charge your batteries. Food: Sandwhiches, snikers, nuts, don't go too light on the food.. you're gonna burn serious calories. Your body needs lots of energy for this one. Blister kit: Blisters happen... carrying a few blister bandages is some lightweight insurance. Water filter / purification: Bring something to filter water when you get to the top of the Mist Trail. 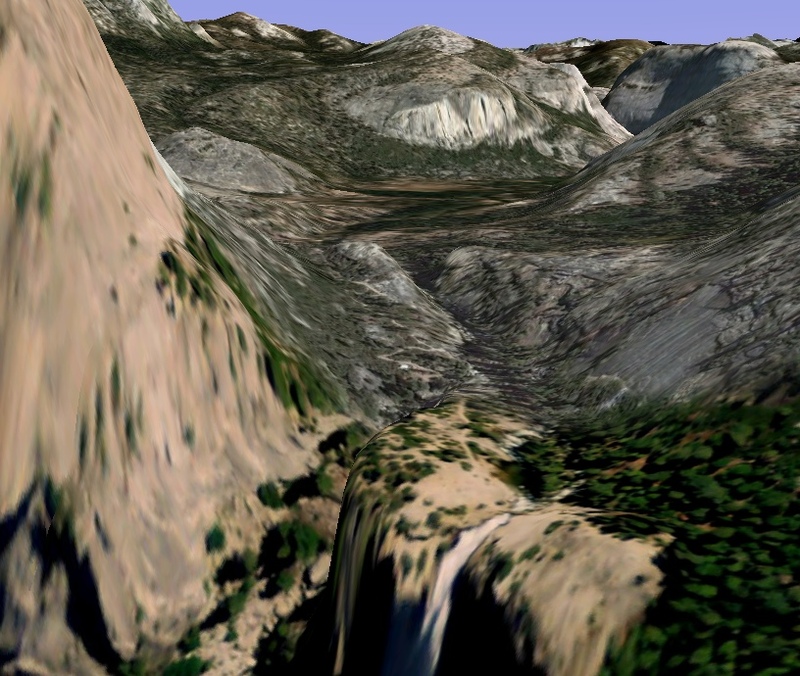 You don't want to drink the water flowing out of Little Yosemite Valley. Sun screen: It's California. Odds are the sun will be shinning. Small knife: For cutting up your avocado, not for hunting bears. TP: Pack a small roll of 'mountain money'. Headlamp: Just incase you are up there longer than anticipated. Leave as early as possible! This is very important! You *do not* want to be hiking up the Mist Trail in the sun. Hiking in the cool early morning air is so much nicer than hiking in the mid day sun. I recommend being on the trail at 6am if you can do it. It is also much nicer to have only a few folks on the trail instead of the mid morning rush hour traffic. You will also be getting the best early morning light for taking pictures along the way. 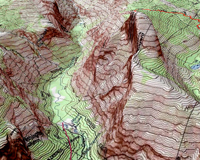 Take a look at the Yosemite Bus Shuttle map to get a general idea of where you are going. 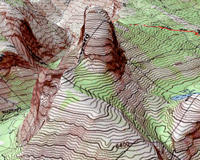 The Half Dome trail head starts at Happy Isles (stop 16, bottom right of the map). The shuttle runs every 10-20 minutes during the summer, is free and pretty dang convenient. The big problem is the buses don't start running until 7am, so if you want to get an early start you should park at the "Trailhead Parking" lot just past Curry Village (shown on the map between stops 15 and 16). This is often referred to as the "Backpackers Parking Lot". If you are staying at Curry Village or the Upper Pines campground, it is easiest to walk to the trail head instead of driving the short distance. 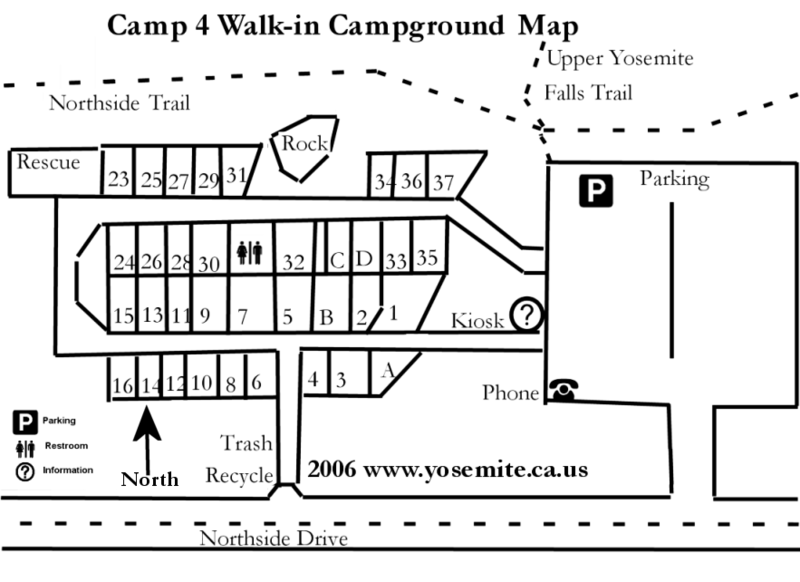 If you are staying at Camp 4, you will want to drive to the "Trailhead Parking" lot shown on the map. Water, how much to bring? There is a drinking water fountain just across the Vernal bridge less than a mile into the trail so plan to fill up there. I recommend hydrating yourself the morning of your hike and keep drinking as you head off to the trail, then fill up at the drinking fountain at the Vernal bridge. There is also a bathroom at this location if you need it. This will be your last option for potable drinking water, so I recommend bringing a water purifier (or purification tablets) to filter the Merced River water. The Steripen from REI is my favorite. There is a good place to get water shortly after you get to the top of the Mist Trail. 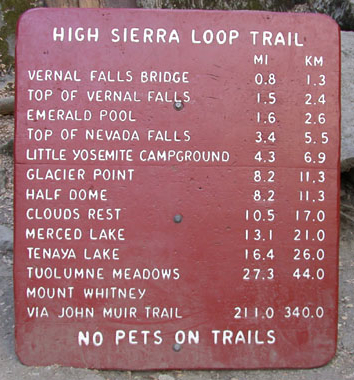 About a quarter mile from the top you start walking down a little and the trail passes the Merced River. There is a nice mellow spot to fill up. There is also a small spring at about 7'400ft, but it is easy to miss if you are not paying attention. I recommend not depending on this spring incase it is not running, or you miss it. Climbing the Cables & What to do on Top! Honestly, it spooks me a bit. Not too scary that you can't do it, but scary enough that your heart will be beating. As long as you go slow and take your time you will be fine. It is just walking up a lot of wooden planks with two solid cables as your hand holds. You will most likely have some folks who want to pass you if it is crowded, but just go slow and let them go. Enjoy it! 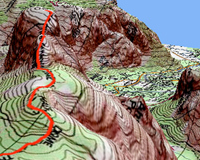 One of the spots to see on top is the 'Visor'. This spot is sometimes confused as being called the 'Diving Board', but the Diving Board is not on the top of Half Dome, but much lower down on the side. There is a small cave on the edge that you can climb into and then dangle your feet (if you dare) over the edge. A nice spot to get out of the sun if it is a hot day. The views are amazing, but it is right on the edge, so be careful!